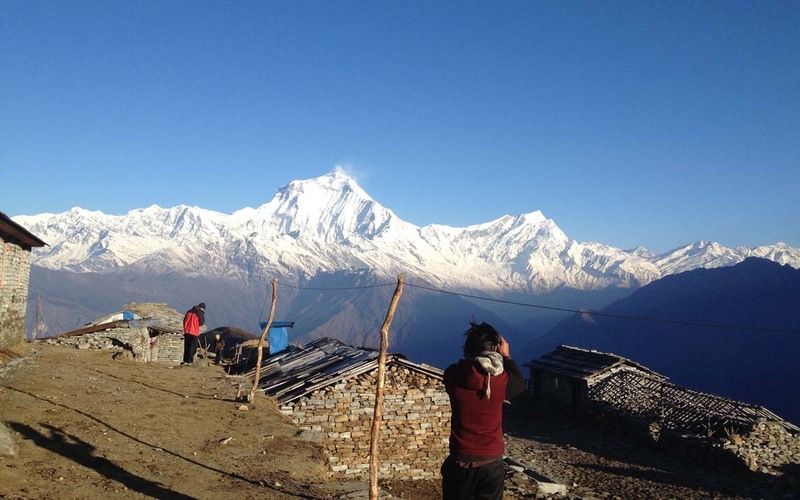 Trekking in Annapurna region Annapurna Dhaulagiri is the one of the best of two week trek in Nepal its community based tea house treks in Nepal. No other treks offer such a rich variety of spectacular scenery, peace and isolation and experience of so many diverse Himalayan culture and lovely people with their worm hospitality. We stay at community run and managed lodges, whose profits directly benefit local schools health post and people. The trail passes through many interesting traditional Gurung and Magar ethnic villages, beautiful forests and rarely trekked high alpine pastures offers magnificent views of the spectacular Annapurna and Dhaulagiri ranges himalaya. Outline Itinerary Day 1: Arrival at Kathmandu airport, transfer hotel, welcome dinner with cultural Nepali restaurant, Day 2: Drive to Pokhara 8 hours, afternoon explore the Lake site, Day 3: short drive to Nayapul trek to Ghandruk (1940 m) - 6 hours Day 4: Trek to Tadapani (2630 m) walk nice rhododendrom forest - 4 hours, Day 5: Trek to Bayoli (3432 m) all the up hills bamboo forest and pain trees - 6 hours, Day 6: Trek to Sistingbung (1890 m) all downhill following incent forest with full of birds, Day 7: Trek to KhobraDanda (3865 m) chance to see the mountain Goat and Yak pastures - 5 hours, it's altitude walk slow afternoon free for dramatic view, Day 8: Trek all the way down to traditional village Swanta(2214 m) - 6 hours, day 9: Trek to Ghorepani (2860 m) traditional Annapurna trail and Pun hill - 5 hours Day 10: Morning climb Punhill (3205 m) trek down to Hile (1430 m) 6 thousand stones stepa following by the Ulleri village - 6 hours, Day 11: trek to Nayapul make a circuit, drive to Pokhara, enjoy at Pokhara, Day 13: Drive or flight back to Kathmandu, explore Kathmandu in a afternoon, Day 14: Annapurna Dhaulagiri Trip end, airport Transfer and fly to home.